It is with sadness that the Ministry of Defence must confirm that Corporal Jamie Kirkpatrick of 101 Engineer Regiment (Explosive Ordnance Disposal), part of the Counter-IED Task Force, was killed in Afghanistan on Sunday 27 June 2010. Corporal Kirkpatrick was attached to the Joint Force Explosive Ordnance Disposal Group, part of the Counter-Improvised Explosive Device Task Force, and was killed in a small arms fire engagement with insurgent forces in the Nahr-e Saraj district of Helmand province. Corporal Jamie Kirkpatrick was 32 years of age. He was born in Edinburgh but lived in Llanelli in South Wales. He enlisted in the Corps of Royal Engineers in September 1997 and, following training as a Combat Engineer and trade training as a Plant Operator Mechanic, he was posted to 28 Engineer Regiment in Hameln, Germany. Over the next six years in Germany he qualified as a Class 1 Plant Operator Mechanic, promoted to Lance Corporal and deployed to Iraq on Operation TELIC as a Plant Section Second-in-Command. After a spell at the Land Warfare Centre in Warminster he was promoted to Corporal in 2006. A tour as a Corporal instructor at the Royal School of Military Engineering in Chatham quickly followed and in 2009 he was posted to 33 Engineer Regiment (Explosive Ordnance Disposal) where he successfully gained his Intermediate Explosive Ordnance Disposal qualification. In April 2010 he volunteered for a tour of Afghanistan on Operation HERRICK 12 just as his squadron was transferred to 101 Engineer Regiment (Explosive Ordnance Disposal). He was attached back to 33 Engineer Regiment (Explosive Ordnance Disposal) for the deployment to Afghanistan. Corporal Kirkpatrick was a member of the Joint Force Explosive Ordnance Disposal Group, part of the Counter-Improvised Explosive Device Task Force. His role was as the Number 2 in a Counter-Improvised Explosive Device Team, supporting the Bomb Disposal Operator. In Afghanistan he and his team started their tour in Lashkar Gah, helping to increase the security of the area by disposing of improvised explosive device constituent parts brought in by the Afghan National Police. In May 2010 he deployed to Kajaki in the Sangin district of Helmand province to work with the 40 Commando Royal Marines Battle Group and played a large part in increasing the freedom of movement of the local Afghans by removing improvised explosive devices from key routes as well as giving life-saving training to members of the Battle Group. Most recently the team moved to support the 1st Battalion The Royal Gurkha Rifles Battle Group, Combined Force Nahr-e Saraj (South). 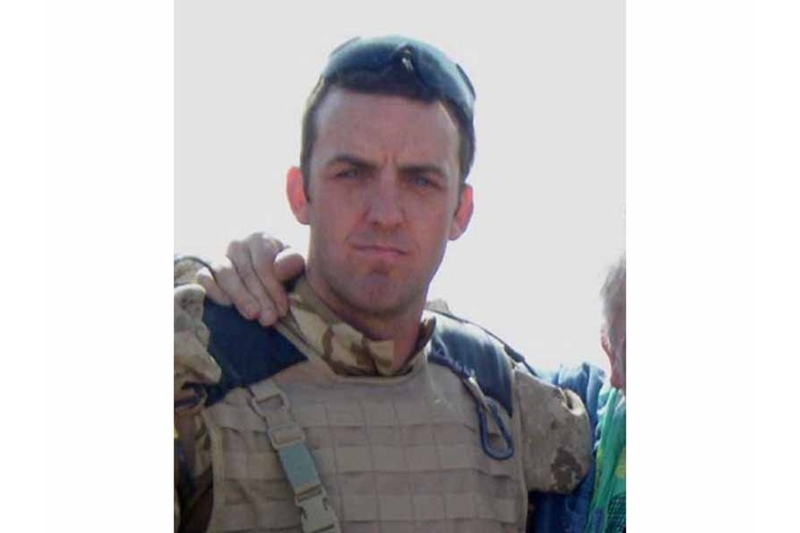 On the evening of 27 June 2010, Corporal Kirkpatrick and his team were being held in reserve whilst a clearance operation was being carried out in order to increase security in an area around one of the checkpoints. Corporal Kirkpatrick and his team were extracting from a compound to move back to Check Point Kingshill when the team came under attack from insurgent small arms fire. A single round hit Corporal Kirkpatrick and despite immediate first aid he was sadly killed in action. He leaves behind his wife Heidi and their daughter Holly. Jamie was a larger than life individual who was loved, loyal and loud. A wonderful son. He was a proud soldier, friend, brother, husband and daddy. The family are devastated by their loss and are struggling to come to terms with the fact they will never see him again. Corporal Jamie Kirkpatrick, or ‘KP’ to his mates, was a robust, humorous and professional Royal Engineer. A Plant Operator Mechanic by trade, Corporal Kirkpatrick sought excitement, variety and challenge in his military career at every turn and no-one was surprised when he stepped up to train in an explosive ordnance disposal role. Deployed in the deadly fight against the improvised explosive device threat, his diligence, coolness under pressure and total confidence in his abilities always shone through and his actions undoubtedly saved lives in Afghanistan. KP was also a natural team player; always keen for a laugh, his irrepressible optimism made him incredibly popular within our tight-knit counter-improvised explosive device community. His greatest passion in life, however, was his family. My heart goes out to his wife Heidi and very young daughter Holly whose loss is unimaginable. KP died doing something he loved, working to save the lives of others and liberate Afghanistan from the improvised explosive device threat - his sacrifice will not be forgotten. Corporal Kirkpatrick’s talent was quickly recognised; he passed his Junior Non-Commissioned Officers’ cadre in 2001 and was immediately promoted to Lance Corporal before being further promoted to Corporal in 2006. Initially posted to 101 Engineer Regiment (Explosive Ordnance Disposal) as a Plant Operator, he recognised the importance of the fight against improvised explosive devices in Afghanistan and volunteered for training as an Explosive Ordnance Disposal Number 2. Corporal Kirkpatrick was an extremely professional soldier, an example to others, and it is devastating that he should lose his life whilst doing the job he loved. Our thoughts are with his wife Heidi and his young daughter Holly on their tragic loss. Corporal Kirkpatrick will be sorely missed but always remembered by all ranks in 101 Engineer Regiment (Explosive Ordnance Disposal). The Joint Force Explosive Ordnance Disposal Group has lost a fine soldier and friend in Corporal Jamie Kirkpatrick. Born in Edinburgh but with Llanelli his home, he was tragically killed in action on 27 June 2010 at the age of 32 and will be deeply missed. Corporal Kirkpatrick, or ‘KP’, first arrived in our regiment early last year with an extensive background in construction and military engineer plant, and the explosive ordnance device world was therefore new to him. “After beginning his training to become an Explosive Ordnance Device Team Number 2, he fast became very passionate about the role and volunteered for service in Afghanistan. Already a very capable Section Commander, KP was also an enormous support to his Bomb Disposal Operator as the team trained and deployed forward to deal with improvised explosive devices. He was a professional and courageous soldier who was in his element on operations with his team. “KP will be remembered as a very genuine and approachable man. He quickly made a huge impression upon the rest of his squadron and carried that through to his deployment with the Explosive Ordnance Disposal Group. I will always remember his beaming smile and tremendous sense of fun, and he was sincerely adored within his team, troop and the unit. He was a big man with a big heart and a cool, mature head who was enthusiastic about life. Morale was high whenever KP was around and he simply inspired. The Group is stunned that Corporal Kirkpatrick has been taken from us. It has been a privilege to know him and we will not forget him. We also know of the love of his family from both what he said and the pile of letters he received from home; our thoughts and sincere condolences go to his wife Heidi, young daughter Holly, parents, and the rest of his family and friends. Corporal Kirkpatrick was a hugely popular and well-respected Junior Non-Commissioned Officer within the squadron. He is praised as being a pleasure to work with and superb to work for. In his job, he was very competent and professional, able to remain calm under pressure and maintain a strong team ethos within his section. With a caring personality he was able to bring on his junior soldiers in a constructive manner. A keen sportsman, he is also remembered for his strength, drive and teamwork on the pitch. Corporal Kirkpatrick was a volunteer for deployment in the bomb disposal role. He worked hard on a number of long courses to gain the necessary qualifications to be able to deploy on Operation HERRICK and he had relished the technical challenge of the role. It is with great sadness that we receive the news of his death. He will be remembered fondly by colleagues and friends within his squadron and our thoughts go out to his family at this time. Corporal Kirkpatrick was a member of 1 Troop, 21 Field Squadron (Explosive Ordnance Disposal). He was a loving husband to his wife Heidi and also a loving father to his daughter Holly to whom I can only send my heartfelt condolences. I also send the sincere sympathies on behalf of every member of 1 Troop, for whom his loss is a bitter blow. KP was one of the stalwarts of the troop, always to be found in and around the restroom even when seconded back to 22 Headquarters and Support Squadron for his digger skills. His loyalty to the troop was never called into question, except when the choice between family and social occasions had to be made. His family in Wales always won. He was a man whose family and friends meant everything to him. “The troop will miss a character that can never be replaced. He led from the front on everything he did and inspired all of those around him including his superiors - a Sapper through and through. KP was a soldier who lived for his job during the week and his family at the weekends. He will be missed by all those that have had the privilege of knowing him. KP has been the backbone of our Explosive Ordnance Disposal Team for some time now - it is my team but he ran it. During any task, be it training or operational, I could ask for a piece of kit or something to be done and it was already there or already done. His sense of humour was his strongest point, he could make you see the funny side of every situation, and with his sense of humour came his level-headedness. I regularly turned to him for a sanity check and I fully trusted his judgment. He was a solar-powered soldier, he named our team ‘Team Handsome’ and it stuck; we couldn’t go anywhere unless we looked good and there was always time to top up our tans. He leaves behind his daughter of 15 months, Holly, and wife Heidi in Llanelli as well as his mum, dad, brother Ross and sister Claire. He was devoted to them and was looking forward to teaching Holly to use the phone on his two-week Rest & Recuperation so he could hear her say ‘daddy’. I am going to be lost without you buddy, but you still have to look after me. You will not be forgotten. It was a great privilege and honour to have known and served with KP, one of the few people that no-one had a bad word to say about. This was down to his likeable character and ability to see the funny side of every situation, like when we were sitting in the cold and rain in Brecon, he would always come up and sit by me with a big grin on his face and say ‘Just think we’re getting paid for sitting here, it’s brilliant’. KP was an excellent soldier and loving husband and father; he was a true friend that will always be missed by everyone. Rest in Peace mate. KP, loving husband to Heidi, doting father to Holly, true friend and consummate professional. Never afraid to get his hands dirty he would lead by example and inspired those around him to better themselves. “When not making the world a safer place to live you could always be sure to find him bronzing himself in what can only be described as questionable attire. KP will be sadly missed by all who knew him and I feel privileged to have worked alongside him. I’ll miss you buddy. KP was an outstanding friend that will always be sorely missed; he could always be heard having a laugh and a joke, picking everyone up when times got low. KP, it was a privilege to have known you, my only regret was that it was for such a short time. I learnt so much from you mate and I’ll definitely take on board your bronzing tips. Always calm, always composed - the type of man you could depend on. KP, I don’t know how ‘Team Handsome’ will do without you mate, you will never be forgotten. Corporal Kirkpatrick, or KP to the lads, arrived in 21 Squadron around March 2009. Straight away he gelled with 1 Troop like he’d been there for years. He was a quality bloke who everyone respected as a soldier and as a friend; always there for whoever needed him and more than happy to give advice to the young lads whether to do with work or personal matters. His catchphrase ELE (Everybody Loves Everybody) would always boost spirits within the troop when morale was low. I think back to the last time I saw him, in Kajaki when our teams were handing over. We all went for a swim in the dam, me and the lads were jumping off the cliff into the water, and for the life of us we couldn’t get KP to jump off. I will always remember that day and how happy and full of life KP was. My thoughts are with his family, his wife and his daughter who he talked about and loved so much. He will be missed by everyone that knew him. Rest in Peace mate. KP was an inspiration to me - guiding ‘Team Handsome’ through good times and bad, through pre-deployment training and then into contact with the enemy. “Even with rounds whizzing past our ears every time we were in a sticky situation you could depend on KP for morale. He’d pull a silly face and remind you to keep your head down. Always calm and smiling, even when carrying heavy kit, following me across compound roofs and over walls. I’ve only known KP a short while, however he will leave a huge hole in everyone’s lives. I can only imagine how much KP’s family will miss him. KP was incredibly proud of his family back in Wales and talked about them incessantly. We had Rest & Recuperation coming up and he was full of plans of what he was going to do at home and of the change he would see in his 15-month-old daughter Holly. KP had nicknamed his metal detector ‘Holly’ - as a reminder of how careful he had to be whilst confirming devices. Holly, we will make sure that you know what a true hero your dad was. It is clear from the heartfelt tributes paid to Corporal Jamie Kirkpatrick that he was a highly professional soldier who lived for his job. Recognised for his calm, optimism and ability to maintain a sense of humour even under immense pressure, he was evidently an inspiration to his comrades. It was with deep sadness that I learned of his death, and my thoughts are with his family and loved ones.